By Henry James. Originally published as a series in The Atlantic Monthly, this classic novel comes from the pen of Henry James, certainly one of the greatest Anglo-American writers of the late nineteenth century. It tells the sometimes comedic, sometimes dark story of a wealthy American, Christopher Newman, on his first extended tour of Europe. Newman meets, falls in love with, and courts a woman from a Parisian aristocratic family. Although in desperate financial straits, they strenuously resist his attempts to woo their daughter because of his perceived low social status. In his struggle with the snobbish aristocrats, Newman discovers a guilty secret in their past, and is faced with his own moral dilemma: Should he reveal their secret, bring about their downfall, and succeed in winning his bride? James addressed a number of real societal issues in this novel. These include the clash between the youthful wealth and lack of class consciousness of the New World, versus the class-stratified moribund Old World, and the struggle within a person’s moral compass which juxtaposes the “right” thing versus personal gain. The book was originally conceived as a reply to Alexandre Dumas, fils’, play L’Étrangère, in which Americans were presented as loud-mouthed and classless. 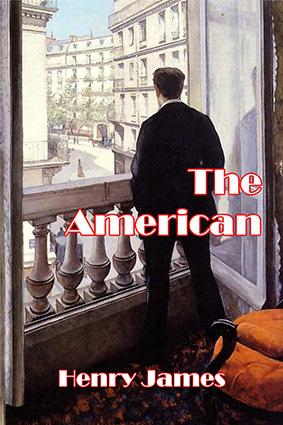 In The American, James showed that Americans were just as much at home in the Old World as in the New, and interwove a storyline which made it the first truly successful international novel. Its all-embracing appeal and timeless themes have ensured its popularity to the present day. Cover Illustration: Young Man at His Window, Gustave Caillebotte, 1875. About the author: Henry James (1843–1916) was born in America but spent the bulk of his life in Britain, and became a British citizen during the last two years of his life. He is one of the most important figures in the nineteenth century Anglo-Saxon literary realism genre, and is best known for his series of novels depicting interactions between Americans and Europe.